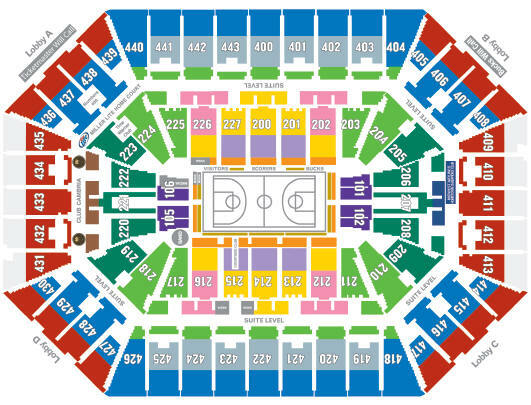 Where are the best seats in the BMO Harris Bradley Center for basketball? The answer my friends is “It all depends.”For college hoops, you might want to sit near the student section. For Bucks games, you might dream of sitting right behind the player’s bench. We’re here to help you find that perfect seat. Some fans want to sit with their feet “on the wood.” While it’s not often that we have courtside Bucks tickets, it does happen from time to time. Try your luck in section 101, row AAA. That’s a seat “behind the hoop,” but you can’t get any closer to the action. Some of us like to be near the student section, while others like to stay a few sections away from the screaming yellow horde. Either way, you need to know where “the kids” sit. That would be in sections 105-106 and 220 through 222. Sometimes they reach all the way up to the 400 level, directly above the sections mentioned earlier. If you want to be close to the Bucks bench, try your luck with sections 201 and 202. A large portion of section 202 goes past the baseline, but seats near the aisle, working towards section 201 will put you close to the players. Sitting in section 200 and 214 is considered to be “mid-court.” from there you will have a great view of both benches, and the scorer’s table. Some of the best seats for the “bird’s eye” view are in sections 400, 401, 443, 421, 442, and 423. These sections (in low rows,) make up the sidelines on both sides of the court. Try to grab lower rows in the upper level. It can get a bit scary when sitting past row P upstairs.